As a Scotch whisky brand, The Balvenie prides itself in craftsmanship; in fact the brand spends an inordinate amount of time educating enthusiasts of its core brand message of five “rare” crafts: their home-grown barley, the use of their own malting floor, having their own coppersmiths to maintain their stills, the expertise of in-house coopers to maintain their stock of precious casks, and the wizardry and experience of its malt master David Stewart. Last year in the United States The Balvenie launched a marketing campaign where the whisky brand partnered chef, author and raconteur Anthony Bourdain in a series of short films, titled “Raw Craft“, featuring various artisanal craft makers from around the country. In this part of the world it launched The Balvenie Connoisseurs of Craft, an initiative to promote craftsmanship in Southeast Asia through the establishment of a conducive ecosystem for creation, apprenticeship, and the advocacy of crafts. At a recent visit to the William Grant & Sons-owned distillery – William Grant & Sons (WGS) also owns and operates The Balvenie’s larger and slightly better known sibling Glenfiddich located right next door – we got up close and personal to witness the parts of the whisky making process that one doesn’t quite get to see at most distilleries – the malting and kilning of home-grown barley, mainly because most distilleries don’t do this in-house anymore… and which just so happens to be a couple of The Balvenie’s five rare crafts. Barley, of course, is one of the key ingredients for making whisky. One of the reasons why there are so many Scottish distilleries located in the glens dotted along the mighty River Spey is because of the rich fertile soil of the region whose fields traditionally produced the barley they needed. Today the bulk of malted barley used in whisky production comes from specialty maltsters, who produce them in large amounts using drum maltings – which steep, germinate and kiln the barley in a drum-like vessel – according to exact specifications of the distilleries. But over the past few years Scotland has started to rely on importing malted barley to help curb the voracious appetite of its whisky industry, especially from England but as far afield as Germany and Denmark. The Balvenie does buy drum-malted barley even though it does grow its barley, as its own production from the 1,000-acre barley fields of Balvenie Mains that surround one side of the Dufftown-based distillery’s property constitutes barely a fraction of what the distillery needs. To give you an idea of how much barley the whisky industry needs: In 2014, the 100-plus distilleries in the United Kingdom required some 800,000 tonnes of malting barley to make whisky; in the same year 500,000 tonnes of barley went into brewing beer in the UK. Ten years ago it was the other way round. What malted barley The Balvenie does buy comes in huge trucks carrying cargoes of the finished grain that empty their tanks into the grain silos built below ground. 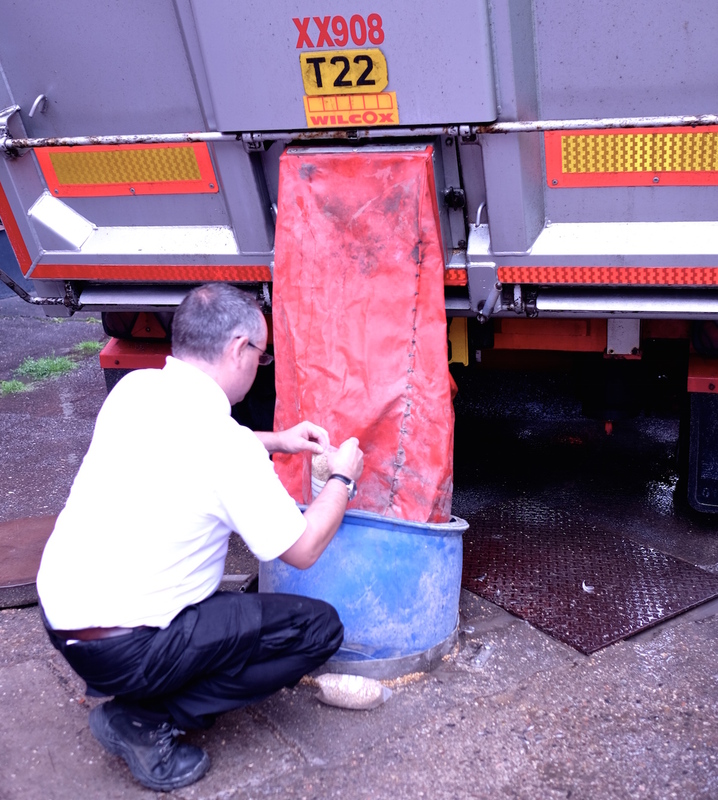 The distillery’s mashmen, like Stephen Archibald (pictured above), bag a sample from every shipment that’s delivered to check and ensure that the malt of sufficient quality and will provide the yield required. But barley that’s not been malted cannot be used for making whisky, so the home-grown barley harvested from Balvenie Mains has to be malted first as well – that’s where The Balvenie’s rare craft of using its own malting floor comes in. In fact they are one of the last distilleries in the Scottish highlands to actually employ and operate their own malting floor, which malts barley in the old way. 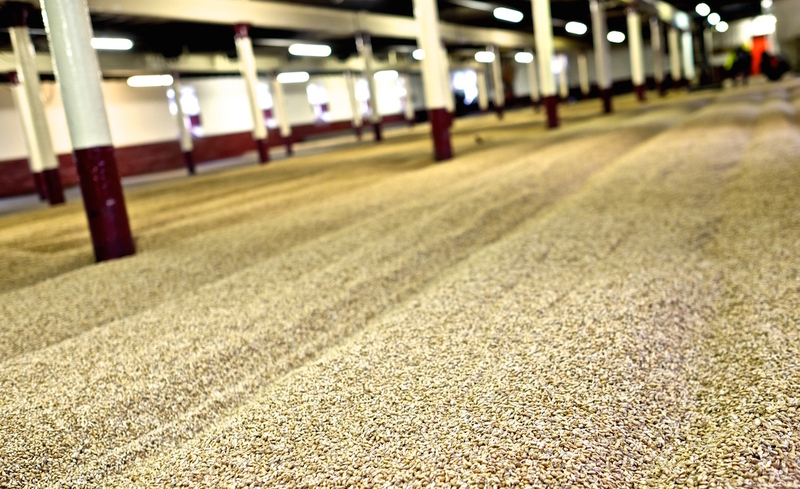 The barley grain, after it is steeped in spring water garnered from the hills above the distillery, is spread on the malting floor and given an ideal, warm and damp environment to help kickstart the germination process which helps convert the starch into sugars. In the old days workers will gently and regularly toss the germinating barley so as to release trapped carbon dioxide and to prevent matting, but these days special (and labour-saving) equipment is used to do so. But germination needs to be halted to retain sufficient fermentable sugars, and that’s where kilning comes in. 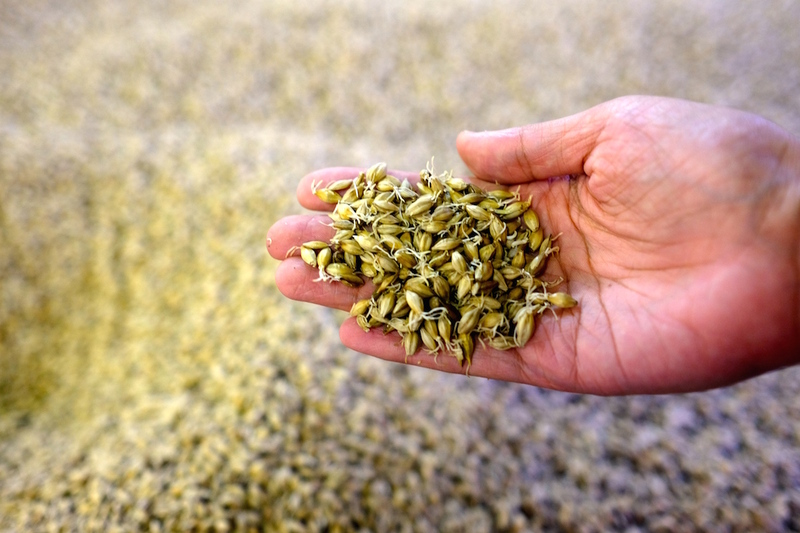 The green malt, which has begun to sprout roots, are dried carefully in a very warm to stop the barley grain from converting totally to cellulose. And because The Balvenie still do their own malting they actually have an active malting kiln which most other distilleries have but no longer use – you’d recognise them by the pagoda-looking towers that top one part of a distillery. 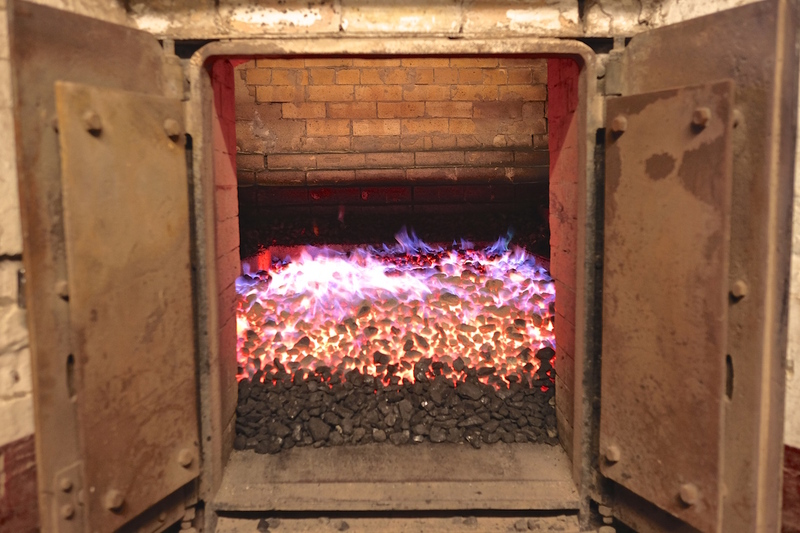 Anthracite coal provides the fuel for the kiln that heats the malting floor, but a carefully measured amount of peat is added as well for a smoky complexity. If you stuck your head inside the kilning room and took a big whiff; the smokiness might remind you of those hazy days courtesy of burning Kalimantan forests… just far more pleasant. 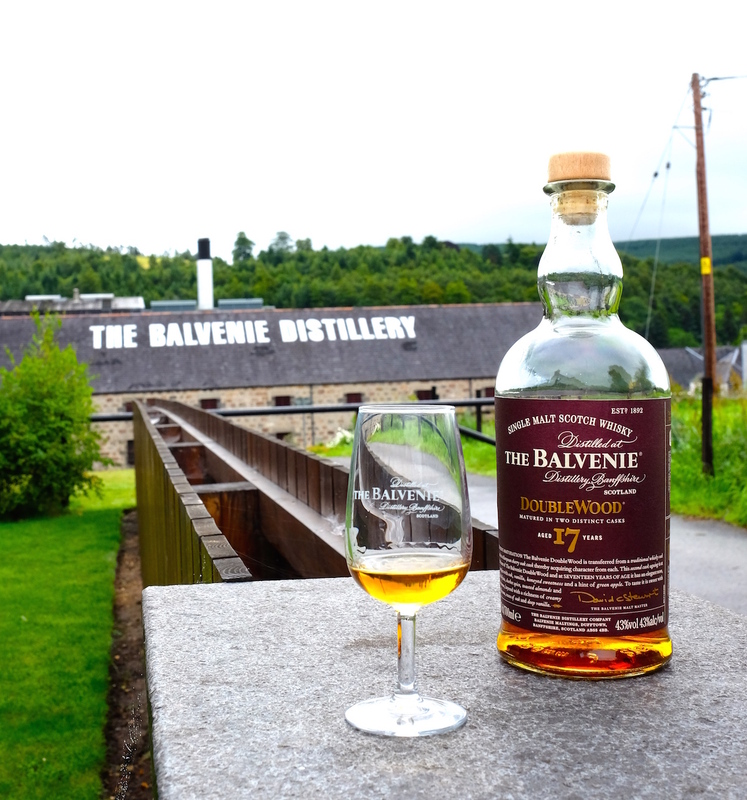 If you’ve tasted some smoke and peatiness in Monkey Shoulder whisky, it’s the very lightly peated malt from The Balvenie that goes into that blend which gives it those specific flavour components. We have to remember that this malting and kilning process is really a relic of bygone days, harkening back to the time when distilleries still malted their own barley onsite; The Balvenie is worth visiting just to witness this part of the whisky making process. Once the malted barley is dried it’s ready for the next part – mashing, where the barley grains are first crushed and then boiled to produce a dark-coloured sweet liquid called wort. This is usually the first part of the whisky-making process you’re brought to see at most other distilleries. At The Balvenie’s mashing room you may again run into Stephen Archibald. In fact 46-year old Steve – who’s worked at the distillery for 27 years and who started as a cleaner cleaning out the stillhouses at Glenfiddich – is normally found here, taking samples of the wort from the various mash tuns to check for quality and consistency. If he offers you a taste of the hot sweet liquid, do accept graciously – he takes his wort very seriously. That wort, after all, is the very essence and culmination of the first two of The Balvenie’s rare crafts. As with other distilleries the rest of the process is pretty much similar; only the size and shape of the stills really do matter when defining the DNA of a distillery’s distillate that finally ends up in casks to age over time. Here’s where the skilled in-house coppersmiths and coopers come in, the next two of The Balvenie’s rare crafts. And after their work is done comes malt master David Stewart’s skill and experience, the final of the five rare crafts, in choosing and blending whiskies for the final product. 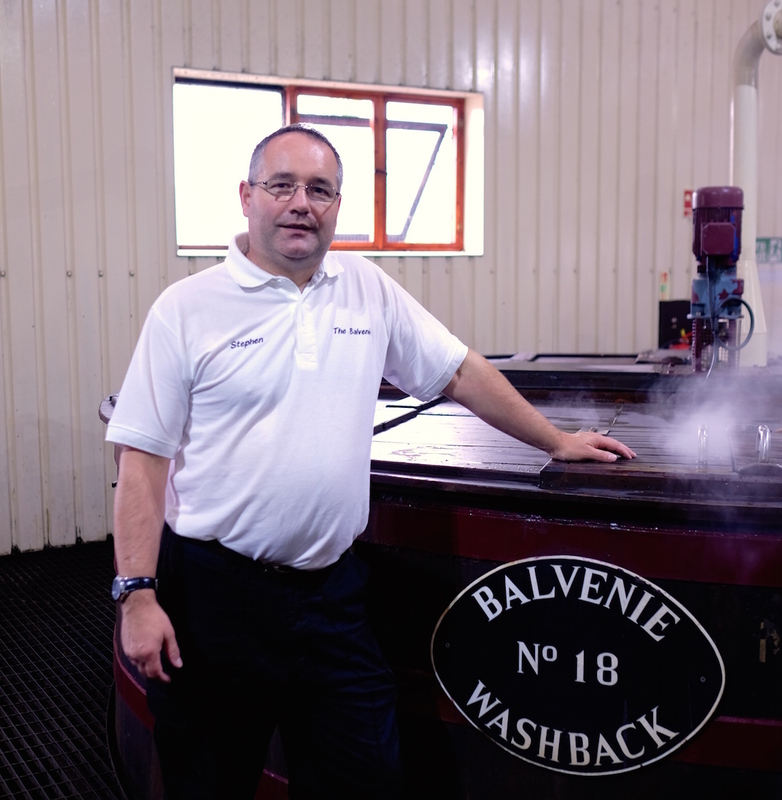 Before one visits the distillery you may have the impression – perhaps in part to the brand’s consistent messaging – that the first two rare crafts touted by The Balvenie is about ingredients and a piece of the distillery’s infrastructure. But it is when you meet the folks behind the scenes, like the farmer who tends the barley fields at Balvenie Mains or mashmen like Steve Archibald who’ve put heart and soul into their work that contribute to the final end product of a bottle of liquid gold, that you finally realise that they are – as with the other three – really about people and their approach to their craft.